On Sunday, March 6, the English department hosted a live reading of the epic poem Paradise Lost, by John Milton. Volunteers sat around the big oval table in the Fager Lounge and read the more than 10,000 lines from 12 books. “The Miltonathon, which began last year, is a tribute to my late friend and colleague Professor George Hudson, who taught Milton at Colgate for over forty years,” said Professor Deborah Knuth Kleck, who now teaches the Milton course at Colgate, and started this event. Marathon readings of Paradise Lost at other colleges exist, but Kunth Kleck has never heard of one that has the reader play parts. Participants at Colgate divided up roles as they read, so sometimes the narrator had only a couple of words — like “she said” — before a speech resumed. “Professor Judith Oliver, emerita professor of art and art history, for example, got to be God!” reported Kunth Kleck. 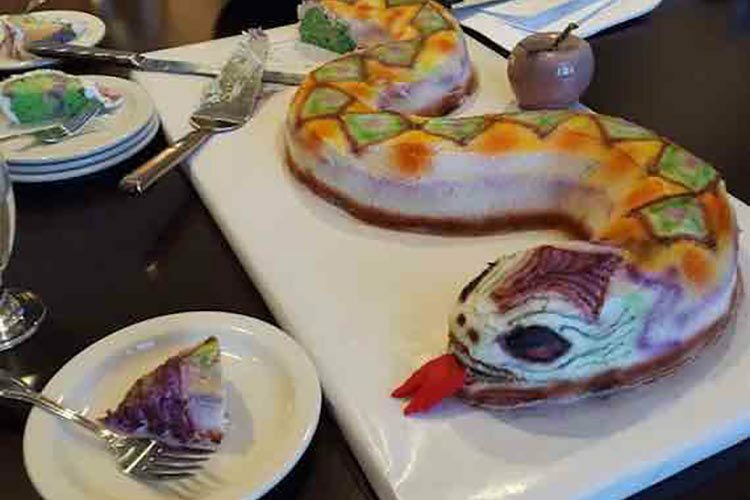 The day included a snake cake (pictured above, designed and executed by local baker Sharon Stevens) and live tweeting on Colgate’s Twitter feed. Every tweet was written by English major Emily Daniel ’18.